I've concentrated on sterling silver frog jewellery in this hub because it's affordable yet is also a precious metal whose value is always going up. Furthermore, sterling silver suits most people, because it looks good on a range of skin tones. 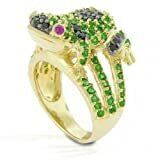 Amazon.com has a great choice of sterling silver frog jewellery, at prices to suit most pockets. This cute little froggy ring is set with genuine Marcasites. This ring measures 5/8" across the top and is crafted of genuine .925 sterling silver. When it comes to frog earrings and brooches, it's possible to choose from a range of gemstones, including amber. Or try enamel - one company you might not have come across is Zarah, which specialises in enamelled sterling silver pieces, often with an animal theme (their silver cat earrings and pendants are fab). 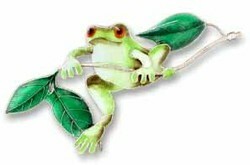 Zarah also does sterling silver and enamel frog brooches, some of which come with matching earrings. The frog montage pin and earrings (designed by Sue Coccia) both have a gorgeous butterfly design on them in blue. If you want earrings but not necessarily a matching brooch, then Zarah's "love frog" dangle earrings (designed by Linda Bolhuis) could be for you, or would make the ideal Valentine's day gift for a frog lover! If earrings aren't enough as a Valentine's day gift, you can always add Zarah's matching Love Frog pendant/necklace. This comes with a large bale so could easily be threaded onto a cord or leather thong rather than a thin chain. I was also very much taken with Taos Trading's 3D climbing tree frog pendant, with a peridot bead. Peridot is traditionally associated with openness, growth and prosperity, and is the birthstone for August. For something a bit different, you could also go for an Alan K Millacreli silver frog pendant, made from sterling silver and millefiori glass. And if it's sterling silver frog charms you're after rather than full-size pendants, then Amazon does a great one with real emeralds. Hope this page has given you some inspiration - check out my other jewellery pages here on Wizzley!